Renowned Czech composer Sylvie Bodorová earned her formal musical training in Bratislava (conservatory), Brno (Janáček Academy of Music and Performing Arts), and Prague (Music and Dance Faculty of the Academy of Performing Arts). She then went on to acquire in-depth knowledge of contemporary compositional techniques during her residencies in Sienna (Franco Donatoni), Poland, and Amsterdam (Ton de Leeuw). In the 1990s, Bodorová worked as a visiting professor at the University of Cincinnati College-Conservatory of Music, as well as in other cities across the United States. She is one of the most sought-after and most-performed Czech composers. Her compositions have become established internationally in performances by renowned artists and orchestras (Thomas Hampson, Gabriela Beňačková, Soňa Červená, Štefan Margita, Ivan Kusnjer, Elmira Darvarova, Wiener Virtuosen, Israel Philharmonic Orchestra, and others), and represent contemporary Czech musical culture on leading musical stages and at renowned festivals. Sylvie has gained international acclaim with such pieces as the Terezín Ghetto Requiem for Baritone and String Quartet (1998), which has been performed in numerous cities across the US, at Wigmore Hall, during the celebration of the fall of the Berlin Wall at Berlin’s Deutsche Oper, and in Warwick and Coventry, among others. Additionally, this piece went on to be recorded in the United States (Christopheren Nomura). 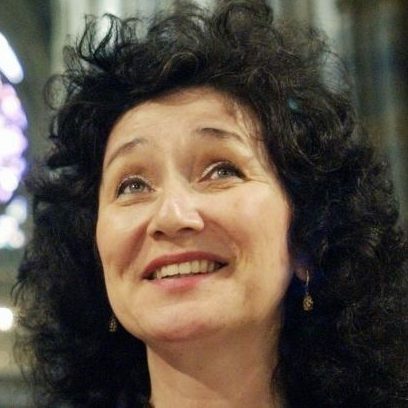 Sylvie Bodorová wrote the highly successful, full-length oratorio Juda Maccabeus (2002) for the Prague Spring festival, and composed another large-scale oratorio, Mojžíš (2008) for the momentous 50th annual Smetana’s Litomyšl festival. She was commissioned by the embassy of Luxemburg in Prague to compose the Carmina lucemburgiana suite for strings in 2009, and in that same year, she created the Balkan and Roma musical project, JA RA LAJ, for tenor Štefan Margita, violin, clarinet, harp, percussion, and strings, which represents a distinctive glimpse into the area of World Music. Additionally, in 2010, the Luxemburg Sinfonietta commissioned a composition on the texts of Franz Kafka: Kafkas Träume. Most recently, Bodorová has been focusing on full-scale symphonic and vocal-symphonic genres, with her Symphony No. 1 “Con la campane” for the Prague Symphony in 2011, as well as the cycle Lingua angelorum for Baritone and Large Orchestra, commissioned by Thomas Hampson (2012), and in 2014, she completed her first opera, Legenda o Kateřině z Redernu. Sylvie Bodorová has extensive training in 20th-century compositional techniques with particularly detailed knowledge of the Polish school, and utilizes a fusion of a variety of diverse elements in her composition. These include namely heterophony, an emphasis on the element of timbre, and frequent use of Balkan rhythms is also typical. Additionally, manipulation of meter is characteristic of her opus in general. Her work—which has leaned toward Neo-expressionism in her latest period—also features the use of various types of modality—both horizontally and vertically. Sylvie draws on inspiration from the Roma culture (from her own studies in the field) as well as Jewish music (a study tour at cantorial schools in Israel). She also finds inspiration in contemporary approaches to both folk (particularly Eastern-European) music and other segments of contemporary music as well. In 1996, together with Luboš Fišer, Zdeněk Lukáš, and Otmar Mácha, Sylvie Bodorová founded the creative group, Quattro. Bodorová is on the supervisory board of the Ochranný Svaz Autorský (Author’s Protective Union).